Jennifer Coddington considers herself successful when she helps young patients establish healthy habits that last their entire lives. A pediatric nurse practitioner with a doctor of nursing practice degree and 14 years of experience, Coddington is a clinical assistant professor of nursing. In addition to seeing patients and teaching the next generation of nurse practitioners, Coddington recently was quoted in a New York Times opinion piece. It argues that training more nurse practitioners is key to the future of the U.S. health care system. What is required to become a nurse practitioner? A nurse practitioner has at least a master's degree and is trained for two or three years following the receipt of a bachelor’s degree in diagnosing and treating diseases. The current recommendation by the American Association of Colleges of Nursing (AACN) is that the doctor of nursing practice, or DNP, is the end degree. Nurse practitioners can diagnose, order diagnostic tests, prescribe drugs and manage plans of care -- they can do many things that doctors do, but nurse practitioners focus more on patient education and health promotion, which in the end can make people healthier and help rein in costs. As the Affordable Care Act brings more people into the nation's health care system, education and prevention really will be key, and so I think nurse practitioners have a particularly important role in that legislation. Also, the law will create a need for more health care professionals in general, so nurse practitioners are doubly important. When did you know you wanted to be a nurse practitioner? As a small child, I always knew that nursing was the profession for me. It's a very holistic and caring field, and I liked the approach nurses and nurse practitioners took as opposed to some other health care professionals. That approach includes a belief that patients have a role in their own care. Nurses and nurse practitioners take that into consideration, as well as their patients' background, culture, beliefs and economic status. Why did you decide to be a pediatrics nurse practitioner? I've always loved children. When I was a staff nurse, charge nurse and educator at a The Children’s Hospital of Illinois, I saw children who came in all the time for things that were preventable -- injuries, illnesses, you name it. I decided I wanted to help them prevent those conditions, instead of just taking care of them when they became sick, so I decided to become a nurse practitioner and to specialize in pediatrics. What are your responsibilities at Purdue? I'm director of our pediatric nurse practitioner master’s program, interim director of our doctor of nursing practice program, and director of practice and outreach. As part of those roles, I teach students and see patients at our nurse-managed clinic in Delphi. I'm also helping to design the Nursing Center for Family Health clinic that will be located in the new Lyles-Porter building, which is an interdisciplinary building that houses all of the Health and Human Sciences clinics. We're making sure that space works best for our students' and future patients' needs. I'm also co-clinical director of the North Central Nursing Clinics, which is a federally qualified health center (FQHC) with clinics located in Delphi and Monon. I'm on call at those clinics constantly. The clinics are moving toward patient-centered medical home (PCMH) status, which will use quality measures to ensure we're improving patients' outcomes and the quality of their care. 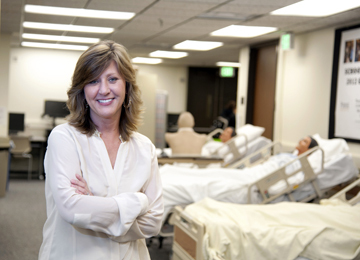 We hope to become one of the first nurse-managed facilities in the country this fall. How do you think pediatric nurse practitioners will fit into the future health care model? Pediatric nurse practitioners are best positioned to start educating children and their family members early about the effects that chronic diseases can have on their health and lives. Some patients have very little knowledge about health issues, including how important it is to eat healthy and participate in physical activities, so knowing this early will have a huge, positive effect on our health care system. In the end, if we can educate more patients, they'll be happier and healthier, and our health care costs will decrease for the effort. By increasing the number of nurse practitioners in our health care system, we can positively improve the quality of care delivered to patients, increase access, and help decrease health care costs.